Property developers and lenders are cherry-picking the best property buyers who meet tough new lending criteria and dumping the worst – despite falling prices and plenty of new stock flooding on to the market. Cashed-up property investors with 20 per cent deposits are being wooed by everything from lucrative cash incentives to rental guarantees, cheap loans, free blinds and upgraded fixtures and appliances. But struggling investors, typically with small deposits and lower equity in their property because of falling prices, are being hit with higher rates, tougher terms, blunt warnings to find another lender or threats of legal action and penalties for contract breaches. Top-shelf investors – both new and those chasing a better deal with a competing lender – are being offered generous discounts, lending rates below 4 per cent and cash incentives to cover transactional costs. CBA, for example, is offering $2000 cash back for new investment mortgages and lines of credit for loans of $500,000 or more taken out before December 21. HSBC Australia is reducing variable and fixed-interest rates on owner-occupied and investment home loans by up to 66 basis points. Its loan for owner-occupied, principal-and-interest borrowers is down by five basis points to 3.59 per cent. There are plenty of other good deals for cashed-up, canny investors in falling markets, say mortgage brokers. A pipeline of new apartments ready for completion, particularly in Melbourne and Sydney, means developers are willing to cover rent between settlement and finding a tenant, rebating up to 50 per cent of stamp duty and including free blinds and appliance upgrades. “Lenders are interested where the deal stacks up,” says Christopher Foster-Ramsay, principal of mortgage broker Foster Ramsay Finance. 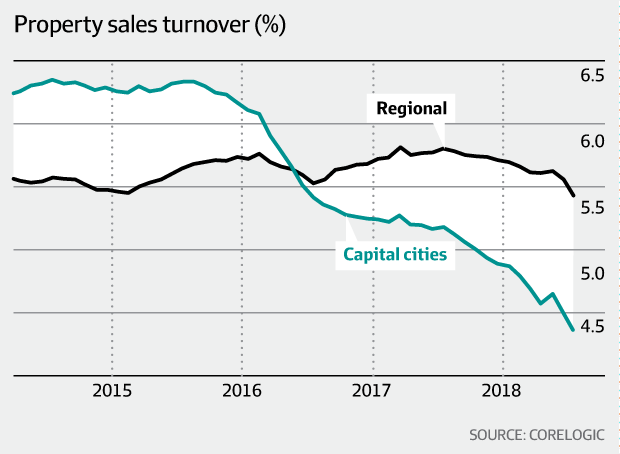 “That means a quality property in a good location with reliable rental return and strong prospects for capital growth.” But lenders are blacklisting deals in dozens of postcodes where skylines are dominated by high-rise apartment complexes. Many loan applications are being rejected or offered less than the amount requested. An estimated 270,000 dwellings are under construction – of which about 70 per cent are apartments, primarily in Melbourne and Sydney. Tim Lawless, CoreLogic research director, says many of the apartments were sold off the plan when demand was strong and prices were rising, also largely around Melbourne and Sydney. Investors who cannot settle are likely to lose their deposit and could be sued for any transaction costs, including the difference between the contract and ultimate selling prices. Bigger deposits, tighter settlement deadlines and cooling-off periods, tougher scrutiny of income and expenditure and lender culling of risky loans are being imposed as market conditions deteriorate, particularly for interest-only borrowers. Nervous investors are flipping properties despite the risk of loss in a falling market, particularly after the high cost of short-term finance and marketing and sales expenses. Marginal investors – or those who do not have their finances approved before purchasing – are having their applications rejected or delayed, as lenders seek more details on their income and spending. Off-the-plan buyers increasingly run the risk that falling property prices will result in property being worth than the purchase price at completion. For example, AMP, the nation’s largest financial conglomerate, is axing new mortgages to property investors with five or more properties, the latest lender to crack down on borrowers with multiple dwellings. AMP is tightening scrutiny of all loan applications and banning new loans to investors whose property-related income, which is typically rent, is more than half of their total declared income. It is also decreasing the maximum amount of verified gross rental income it will accept for loan-servicing purposes from 80 to 70 per cent for properties in higher-risk zones, such as inner city high-rise apartments that can be subject to over-supply. Other lenders, including Westpac Group, the nation’s second-largest lender, is requesting risky borrowers find another lender amid growing concerns about the impact of rising rates, falling values and oversupply, according to mortgage brokers. The bank is sending a single-page letter to investors warning it can “no longer support our commercial relationship with you”, adding it will work with the borrower to help find a new lender, say mortgage brokers. The bank denies it is a systemic policy. Shabanz says property buyers who cannot find another lender, usually because they have little equity and a small deposit, are being hit with higher interest rates. The number of households with an investment property grew strongly during the height of the property boom in 2015-16 when cheap money and big profits drove expectations of wealth, according to analysis by the Australian Taxation Office and Morgan Stanley Research. Investors were encouraged to make the most of record low lending rates and generous capital gains tax concession to create property portfolios, particularly as a way to boost retirement income. Investors owning between four and six properties increased by about 4 per cent to about 45,000 and 20,000 respectively, with nearly 1.5 million owning one, the analysis reveals. CoreLogic research shows more than 14 per cent of Sydney apartment owners’ resales are at a loss, a rise from 11 per cent in the past 18 months. Further, the number of off-the-plan apartments that are valued at settlement below the price in the contract has jumped from 11 per cent in April last year to 30 per cent last month. That is before various sale and holding costs that can add another 10 per cent.